David Brody of the Christian Broadcasting Network first reported on the exclusion of the word "God" in the Democrats' platform. 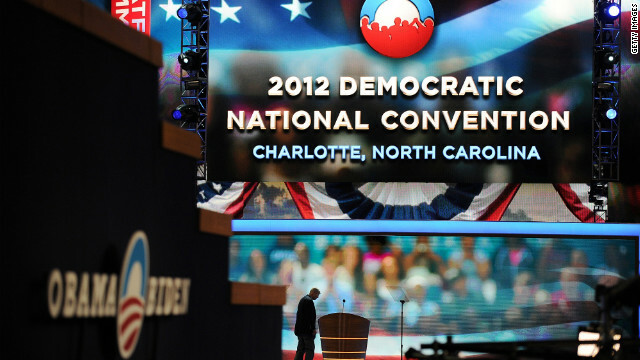 Democrats did include a section in their 2012 platform specifically devoted to faith, writing faith "has always been a central part of the American story, and it has been a driving force of progress and justice throughout our history." "There is no conflict between supporting faith-based institutions and respecting our Constitution, and a full commitment to both principles is essential for the continued flourishing of both faith and country," the document reads. A Democratic official pointed out that 2008's reference to God was not specifically about faith, but rather about growing the middle class, and that the 2012 language specifically referring to faith was identical to 2008's document. The official also noted that the word "faith" appears 11 times in the document, "religion" or "religious" 9 times, "church" 2 times (one time appearing within a quote), and "clergy" 1 time. The lack of references to God in the 2012 platform is a change both from the 2008 document, with one reference to God, and the 2004 platform, which mentioned God seven times, as noted by The Blaze. In 2000 the Democrats' official party platform mentioned God four times. David Silverman, president of American Atheists, said the exclusion of "God" in the Democrats' document was a step forward in including non-religious Americans in the official party stance. "We are obviously happy that the Democrats are taking these positive steps," Silverman wrote. "We are looking for the inclusion of everyone and we are hopeful that that inclusion will continue to the point that we can depend on Mr. Obama to repeal the faith based initiatives and reinforce the separation of church and state." "It comes as a pleasant surprise," he added. "It is something that we have been pushing for and is certainly a positive step. But it is only one step and I would like to see action more than words." "God" is the second conspicuous omission from the Democrats' 2012 platform. The party also removed a 2008 reference to Jerusalem as the capital of Israel, a diplomatic flashpoint that Republicans decried as a slight to the Jewish state. In the Republicans' official 2012 party platform, God is mentioned ten times in various forms, including seven cases of the phrase "God-given." YAY! remove all religion from the government. thank you! That’s a real shocker. All the God haters in the Democratic party prevailed. Isn't this also telling, " The party also removed a 2008 reference to Jerusalem as the capital of Israel." Something we all know is Obama's distaste for Israel behind closed doors and his luke warm receptions in public for the PM. As with most of his views they evolve farther left with each passing day in office. Simple choice in this election: Mitt Phony for the rich, Obama for the middle class. If Mitt Phony is elected, get ready for the beggining of the Bush era but this time on steroids. Complete collapse of the final system , also known as deregulation. Mitt Phony's motto "Make me President now, I'll give you the details later"
We also believe in our God-Given Free Will (choice). We don't wear it on a sleeve and then kill our fellow-Americans by starving them to death or sending their jobs overseas. Shame on Mormon Mitt and Lyin Ryan. "God" really should not be part of the platform in a secular government. "In God We Trust" was added in the 1950s....and re-affirmed by the Tea Party House earlier this year. This platform is about American Middle Class. Obama12. So what the GOP mentions God several times in their platform and the Democrat a couple of times. A lot of people mention God, but is it The God of the Bible, meaning God the Father, God the Son and God the Holy Ghost–The Triune God; and who Jesus is to Christians, Lord and Savior, a belief that Romney and his religion reject(Then how can true Christians support this???) What also matters a great deal is practicing Christian values and principles while at the same time accepting Jesus as Lord and Savior. Some politicians use and abuse Christians for political gain. What makes it so pitiful, some Christians know this and will blindly follow the GOP rhetoric anyway. While I do have some issues in the Democratic Platform, I have plenty of problems with the GOP/Tea Party Platform and what they actually say, do and what's really scary, what they propose to do! If R/R are elected Lord help us; it will be too late days, weeks and months later to say why did I vote for R/R! Separate church and state, like the founders wanted it. By the way, you right wingnuts do know that $12 trillion of our national debt is attributed to republican presidents, don't you? If anyome really believes that Obama care about the middle class, you are truly deceived and have drank the kool-aid. In Socialism which is where he is taking us there is no classes and no democracy, just government rule. WAKE UP PEOPLE!! "And when you pray, do not be like the hypocrites, for they love to pray standing in the synagogues and on the street corners to be seen by men." For any people claiming to be Christians who do not recognize the above quote, it comes from Jesus admonition to his followers as written in Matthew. You may not be familiar with that book as it occurs in those inconvenient books in the Bible between the Old Testament and the Letters of Paul. You know. The ones that have the life of Jesus and his sayings. As opposed to Paul (who never met him) and his interpretations of what he thought Jesus SHOULD have said. If the GOP is so about "God", why all the lies coming from their candidates? I was taught as a kid by Catholic nuns that lying is a sin. Note they still have a massive section on "faith" in their platform. The sooner that we remove all religion from the public sphere, the sooner we can have rational and evidence based discussions of important policy questions. The Democratic party has taken such a hard left turn our parents would not recognize it. This is not the party that Clinton successfully led in the 90"s. It is the party of the crazies over on MSNBC which is pretty bad because I switch around a lot and CNN, ABC, CBS and even Fox seem balanced in comparison. "-the simple principle that in America, hard work should pay off, responsibility should be rewarded, and each one of us should be able to go as far as our talent and drive take us." That's really a nice principle. Now, when Obama stops handing our hard-earned tax money over to the corporate interests that destroyed the country for the past 20 years, I'll believe him. Until then, he's just another George W Bush, and his platform is crap. Whereas the Rethuglican Party worships GOD – the Good Ol' Dollar. To be honest, how can any real Christian vote for either party at this point??? Our country was established on Godly principles (That is the God of the Christian Bible). Neither side agrees with the God of the Christian Bible. We don’t owe Gay's a parade, they deserve to be treated like people too, but be Gay and be quiet, and we most definitely don’t owe an atheists anything! Any American, especially a Christian American who disagrees with that is the most UN-patriotic person on the face of this earth. There was never a separation of Church and state either, only a separation of taxation, meaning the government was not allowed to tax the Church because what they can tax they can control, but it seems the evil one has deceived US Again (USA). Get real people; where there is no God, there is no peace! I know the GOP had been using and abusing the christian church in america for a long long time. They proclaim to be pro christianity but betray Jusus teaching in all the programs and legislation they intruduced. Jesus said that "it is easier for a camel to go through the eye of the needle that for a reach man to enter the Kingdom of God." But the GOP continue to protect the rich at the expense of the middle class and the poor. I can't see their christianity, they do the talk but refuse to do the walk. In the other hand it depresses me to learn what the democratic party has done to God and Israel in their platform, it is a shameful act. I'm staying home on election day. Please write another hard-hitting article on the omission of Santa Claus and the Loch Ness Monster next time. The sooner all religions are disposed of the better for humanity. A real patriot believes in ALL Americans, not just the ones who share their religion. There is a obvious difference here between the parties...Democrats tend to lean toward science and skepticism, which both thrive on reason, logic and proof. This is the realm of the non-religious, atheists, etc. which logically leads to less mention of religion. The Republicans pride themselves on preserving the past, tradition, and retention of old-time values, which is a reflection of the fundamentalist support, which relies on faith in a higher power.. This is the reason why 'god' isn't mentioned much by Democrats....religion is becoming increasingly a subject met with skepticism by science and free-thinkers. When Democrats separate church from government that means that Major Nidal Hasan will have to shave his beard off and his reason for growing his beard will be unacceptable, his reason that his beard is an expression of his Muslim faith. Also, his plead guilty for religious reason which a judge could not accept but his guilty plead can be accepted if Democrats separate church from government. Better to leave God absent from the platform than to simply pay lip service. It is a political convention, for heavens sake. Not a bible study class or tent revival.